These Stuart Weitzman Sandals Are 60% Off and a Serious Upgrade From Flip-Flops! We put so much effort into having a perfect pedicure for the spring and summer, whether we take frequent trips to the nail salon or DIY the entire look, so why shouldn’t our sandals be just as cute as our toes? Plain old flip-flops are certainly comfortable, but if we’re looking to make a statement, we’re going to need something with a little more pizazz. The Stuart Weitzman Marina Sandal is just as comfortable as any other flip-flop or slide, if not more so. Shoppers are saying they’re “a perfect fit,” calling them “really cute and really comfy.” We also want to add in that they’re edgy-chic and bound to garner compliments from every sunbather at the beach or passerby on the streets. Oh, and that they’re an insane 60% off! See it: Get the Marina Sandal (originally $298) for just $119 exclusively at Stuart Weitzman! 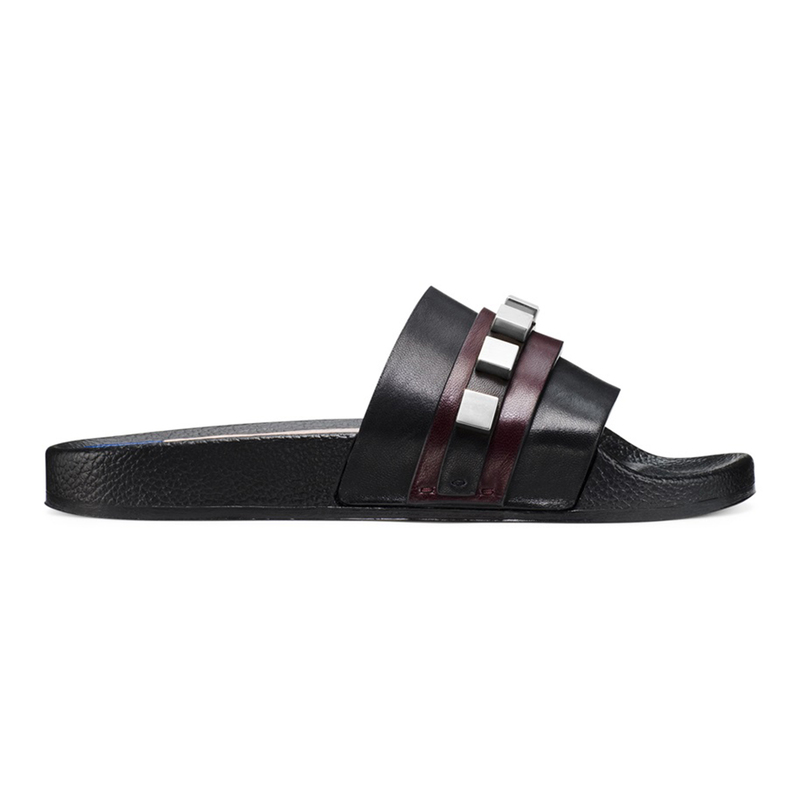 These slides, which were made in Spain, are “equally casual and cool.” They’re a matte black, with a vampy red strip running across the center of the upper. Resting on that red strip is a skinnier black strip, which features the shoe’s main accent: metallic, silver-tone studs! These studs are an oversized square shape, a signature of Stuart Weitzman footwear. We know these shoes are ultimately sandals, but the studs seriously turn them into a stylish source of envy for all other shoe lovers out there! The upper, insole and outsole are all leather on these shoes. The footbed is contoured, molding to the shape of our foot and dipping at the toes for support and maximum comfort. Trust Us, we wouldn’t recommend slides that weren’t comfortable, no matter how fashionable they were! If we prefer a wider width for our shoes, we’re especially going to love these Marinas. As one reviewer pointed out, this slightly wider width is also perfect for wearing with socks or for any plane trips during which our feet swell up. Plus, they’re quick and easy for getting through security! These shoes were created to be equally suitable for a relaxing day at poolside as well as a busy night in the big city. We can easily pair them with a bathing suit or cute and breezy cover-up, changing into raw-hem denim shorts and a loose-fitting tee or tank afterward a day of swimming. No shoe switch-up necessary. For a more dressed-up look, we would pair these sandals with a chic jumpsuit. Dark-wash skinny jeans would be perfect too! Just slip on a crop top and a leather jacket for cool-girl vibes to last until early morning (assuming we’re not sleeping by then). These Marina sandals are exclusive to Stuart Weitzman’s website and select boutiques, so we can be confident that this is the best deal out there, as if the whole “60% off” thing wasn’t convincing enough. This style is not going to be restocked after it sells out, so we need to move quickly, especially with warm weather finally breaking through the chill! Now all that’s left to do is figure out our next pedicure color. We’re definitely coordinating with these shoes, considering how often we’ll be wearing them! How about a matte dark red with silvery nail art to match? We’re feeling it. Making an appointment right now! Who else is coming? Not your style? Check out more sandals here and the rest of Stuart Weitzman’s amazing sale selection here!